It’s a scooter‚ single-rider golf cart‚ and a power-assisted pull cart all in one! Fun and easy to operate‚ our lightweight design makes for easy storage and transport. 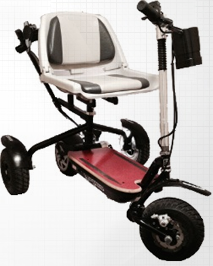 All GoCaddy models are powered by lithium ion for unmatched performance. Choose the one that is right for you and join the REVOLUTION! for great deals and promotions!